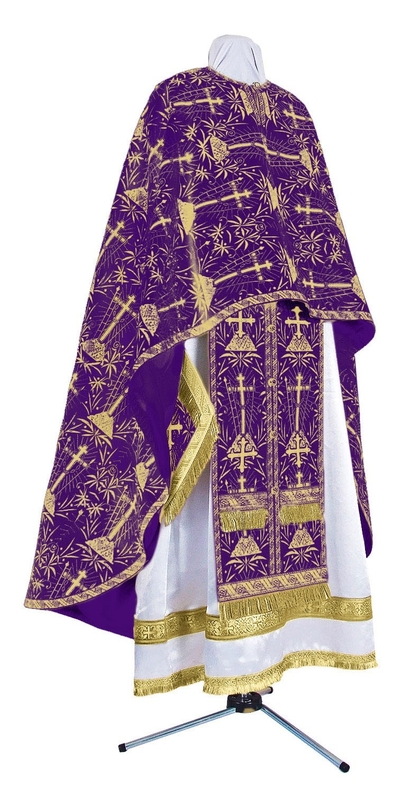 Orthodox Church liturgical Greek Priest clergy vestments (violet-gold) by Istok Church Supplies Corp.
Istok Church Supplies offers a brilliant collection of Greek Priest vestments in violet and gold made according to time honored traditions and instructions. These vestments look regal and resplendent, easily transporting the wearer and onlookers into the Kingdom of Heaven and into a world of piety and spirituality. We understand the important standing of Priests in the Orthodox Greek clergy hierarchy. 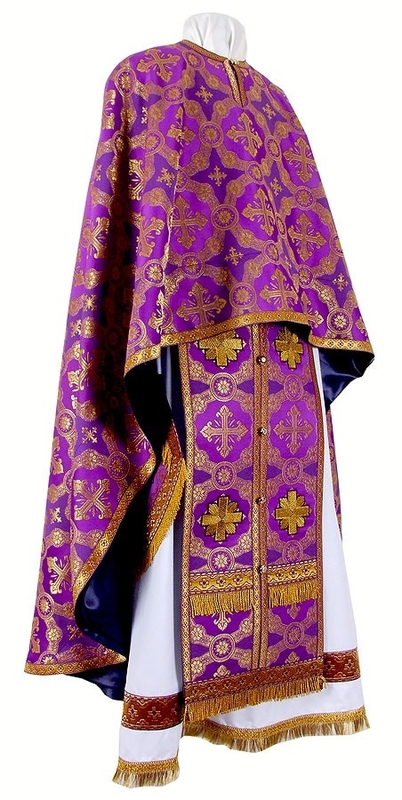 We fashion Greek Priest vestments in violet and gold from rich and magnificent fabrics such as rayon jacquard brocade, metallic jacquard brocade and fabrics featuring embroidery made with high quality German Madeira threads. You can depend on us for the guarantee of quality and workmanship. Our Greek Priest vestments are available as complete vestment sets that include five items – zone, epimanika, epigonation, phelonion and epitralhilion. We provide natural rayon lining and natural velvet inserts for all orders to enhance comfort. 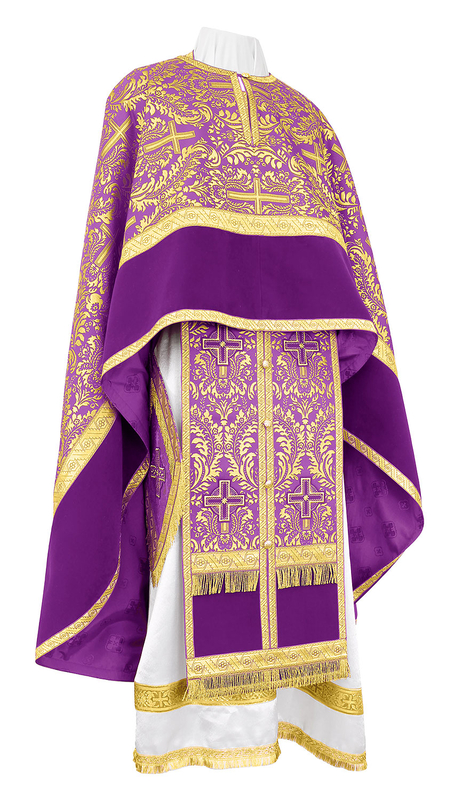 Customers can choose from three decoration options for our Greek Priest vestments violet and gold – standard, premium and luxury. Standard type is economical and includes inexpensive galloon and simple crosses. Premium type is mid-range and includes good quality galloon and elaborated crosses. Luxury type is high end and includes solid jacquard galloon along with exquisite hand embroidered crosses. Customers can add matching chalice covers, veil and an embroidered icon to their orders for achieving the perfect ensemble. We are reputed for providing custom fitting liturgical vestments. Our skilled tailors in Europe are expert at constructing precise Greek Priest vestments that fit flawlessly. Providing custom measurements is easy - simply refer to our online measurement chart and give us your specific dimensions according to that. We offer the convenience of online shopping to customers worldwide and provide safe and secure payment channels along with door delivery services. Customers who have special requests can make a note of them in the Notes section of orders during checkout and we will try our best to accommodate them. We strive hard to bring you the best and most extensive collection of Greek Priest vestments. Happy browsing!